No matter how many years pass, I still remember the excitement of deciding which outfit I would wear for the first day of school. Sure, there was some sadness that the lazy days of summer were over, but a new year in a new class coupled with seeing my friends every day helped whisk that sadness away! The first day of school is exciting, though it can seem a bit scary at times. Having attended the same school district from Kindergarten through my senior year in high school, I didn’t realize exactly how scary until I went to college. Suddenly there were all these people I didn’t know, without a single familiar face in the crowd to ease my anxiety. I had always been sympathetic toward new students and how alone they must feel, but feeling it for the first time myself I realized I hadn’t a clue. And to think – many of them were young children, and I was essentially an adult! In the coming days and weeks things got a lot less scary and a lot more awesome, but what helped me along the way was indulging in familiar things that reminded me of home and who I was. What got me thinking about my first day of freshman year was a conversation with a friend the other day. She mentioned that she couldn’t believe her son was going off to college already, and that she and her husband would be driving him there this weekend to get settled in. I couldn’t believe how quickly those 18 years had passed, or how quickly the summer had passed, for that matter! But one thing I know for sure is that once she’s back I’ll be asking for her son’s dorm address so I can send him a little something I know he loves – Skittles! 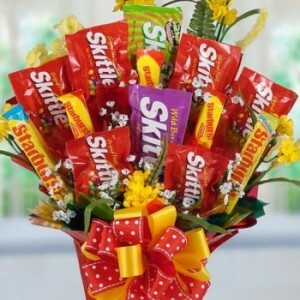 I’m confident the Skittle-licious candy bouquet will bring a smile to his face, and hope that by the time it arrives, he’ll have made some new friends to share it with.